VOPI 4’s will of growth, mainly in its globalization, started in 2003 with the setting up of a company in Hungary. Between 2011 and 2012, VOPI 4’s strategy of expansion made a qualitative change into companies’ set-ups beyond European frontier. 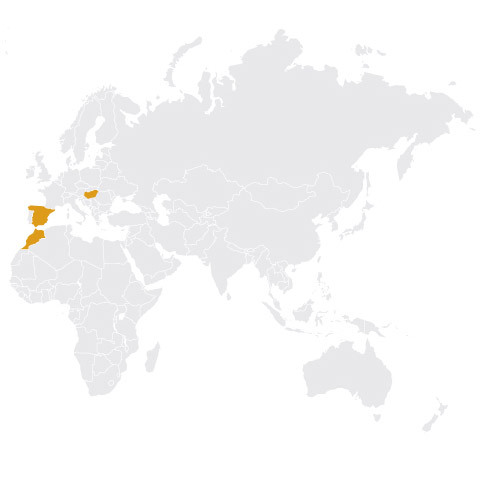 Therefore, first, in Morocco and, then Latin America come into the international map in which VOPI 4 currently operates. A reference on construction that has carried out more than 400 projects and has satisfied more than 200 customers since 1990. Since 2003 has been a comprehensive and specialized service for investors and suppliers, for a feasible project development in Hungary. A subsidiary company that since 2011 has linked the experience and the knowledge gained while constructing the building projects and the civil work. A new company that supplies electricity to other companies, and offers optimization of energy consumption with energy solutions appropriate to customer’s needs. Company dedicated to the integral management of the underground car park sector as well as regulated surface parking.